I attended one of the best professional development activities of my career at the recently held AuthorSpeak in Indianapolis. From the opening keynote by Daniel Pink through the various forty-five minute sessions offered by some of the luminaries in the education field, I was heavily engaged in quality education conversations with passionate educators from across North America. 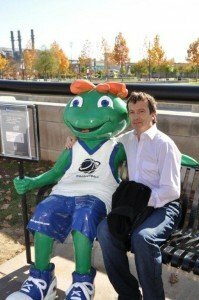 The author poses with a new friend outside the NCAA museum. The chance to attend sessions by other authors was a real treat, as when I normally present at a conference, I don’t get the chance to hear my fellow presenters. I listened to some of my favorites including Doug Reeves who reminded me “better grading policy reduces course failures, improves work output from students, and results in significant reductions in suspensions”. Nicole Vagle suggested, “strong teacher-student relationships are key to engaging and motivating students”. One of my gurus, Tom Guskey, was clear in describing the importance of clarity when he said “as long as the outcome is a secret, learning becomes a guessing game for the student”. Hearing Anthony Muhammad say that “a healthy school culture uses data for information not condemnation”, was a good reminder of the importance of using data appropriately. Bob Marzano is another gracious educator always willing to help colleagues refine their practice. He asked the group to consider what role student feedback should play regarding effective instruction and generated many thoughtful responses. 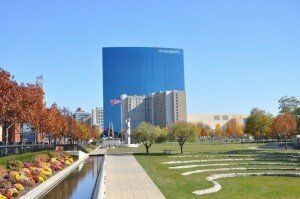 The conference site in the heart of Indianapolis. The other highlight for me was to be able to present a session on our recently released book “Pyramid of Behavior Interventions: Seven Keys to a Positive Learning Environment” (http://tinyurl.com/3bxuyes) with one of my co-authors, Chris Weber. Despite working on the book together, this was only the second time we had met and the first time we co-presented. It was another good learning experience for me as Chris has a wealth of knowledge and brilliant insights from his RTI work with Austin Buffum and Mike Mattos. The sports fan in me also appreciated being in the city that will play host to the US version of the Grey Cup. Living near Vancouver means I’ll enjoy the celebrations that come with hosting the CFL championship. Visiting the city that will host the Super Bowl will make watching that game on TV all the more enjoyable.